Amnesia, Christmas, Classic Chick Lit, Fake Relationship, Lovers Reunited!, Marriage in Trouble, Meddling Relatives?, Scandal! 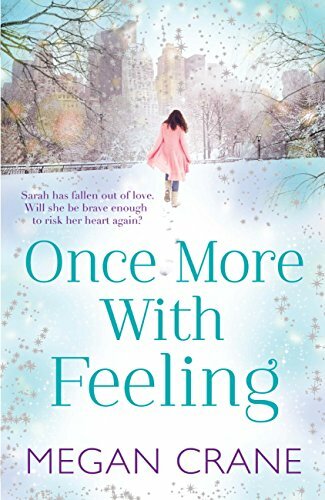 Once More With Feeling has earned a place on my permanent bookshelf. Sarah is an amazingly real character. As a reader you can understand and feel all that she does. The supporting characters are wonderfully well-drawn. This is one of the best women’s fiction novels that I have read in a long time. I can’t wait to see what she comes up with next! Megan Crane has constructed a very vibrant array of characters and has developed a wonderful supporting cast. She took a story/plot that I am sure many of us have read several times – divorce and its aftermath – and made it brand new. She brings all of her characters to life and gives them roles and characteristics that make them seem all the more real to the reader. I enjoyed this book so much because it really makes you re-evaluate your own life as well. Some of the thoughts and processes that Sarah goes through made me question if I am living my life to the fullest or if I could be doing more. Watching Sarah come through this awful time in her life, with the help of some great supporting characters, was very inspirational and very well written. I enjoyed each and every page of this book! Likable characters and great dialogue.